Many parents find themselves, and their children, overwhelmed by the amount of toy in the house and seek to declutter. But when we’re looking at cutting back on toys, the focus tends to lean towards what toys should we keep, that foster imagination and give children hours of enjoyment? Children’s brains are going to develop, they’re going to learn and grow up. There is no perfect set of possessions or circumstances that will create a perfectly well-balanced, intelligent adult, who is a benefit to society. The best things we can give to our children are not things. It is love, acceptance, and relationships with parents that give the best opportunity for becoming lovely adults. Not everything that I recommend here is going to be the best for all children across the board, simply because each person is different, and all interests are different. I’ve had children that love building blocks but won’t play with trains, and children who can play with trains for hours on end and want nothing to do with building blocks. That’s ok! Remember that you are the parent and you can make the best choices for your children and your family- because you know them best. Young children also love playing with things that are not toys: kitchen utensils, pots & pans, Tupperware, etc. They love putting this in, putting on lids and taking things back out. There are really no toys that are absolutely necessary. Books Having a handful of board books are wonderful for little ones. It’s proven to help them in so many ways and it’s a great way to teach how to take care of things (not chewing on them, not tearing them, putting them away when done, etc.). Children love to have their parents read to them and it’s also beneficial when you build book-reading into your daily routines. (After we read a book, it’s time for bed…) Our favorites have been Sandra Boynton Books. Balls Children love throwing, rolling and kicking balls. It’s good to have one that requires 2 hands to hold and a couple that requires one hand like these. Bonus: these toys are often still interesting after the first year. Soft crinkly toys Babies love the crinkly sound that some toys make. These are easy for baby to grab onto and have different parts to keep their interest, like silk tags, bells, etc. Rattle Babies love making noise and in all honesty, a water bottle filled with rice or beans works just as well as something that has been purchased. Teether It’s good to have something for baby to chew on. They are making discoveries with that mouth and it feels so good when teeth are coming in. Animals Children love animals. They enjoy playing with them, holding them, making sounds for them. It’s all great! Our favorites have been Animal Counters, the warning here is that they are not intended for under 3 years because of small parts, so definitely take that into consideration. For some children, it’s not an issue, but there are a lot of children that put things into their mouth. With the animal counters, the younger ones like to put them into things (jars, buckets, cloth sacks, etc) and take them out again. As they get older, they can learn their colors, counting, and patterns, set the animals up in rows, it’s limitless. If choking is a concern and you want them to play without direct supervision, these are nice as well as these. A Baby Doll This varies per child, but if you find them drawn to nurturing a baby, it’s great to encourage that. I am always amazed at how even a young child will gently handle a baby doll and love on it (even if the next minute they throw it on the ground and sit on it… for a brief moment there was tenderness that made my heart swell with pride!) I don’t have a particular recommendation as to which baby doll is best, there are so many options out there and all have different pros and cons. If your family is avoiding plastic, then a Waldorf style doll is wonderful, though I found my children play more with a vinyl doll with a realistic face. For these, it’s best to purchase second-hand so the toy has already off-gassed a significant amount, or purchase a high-quality one that seems to be free of phthalates. Avoid dolls that cry or say “Mama”, because you want your child to talk for the baby, not the other way around. A Train Set Ages 2+. Remember that less is more with toys. Limiting it to a simple set like this one keeps it manageable and not overwhelming for children while still allowing them to experience building tracks and creating different shapes for the trains to drive on. Puzzles Remember that having one, two or three puzzles is great, but getting more than that means lost pieces and too much to choose from. Go with your child’s interest- are they loving talking about colors & shapes, animals or vehicles? Avoid the puzzles that make noise, remember, you want the child to create the noises and use their minds. Building blocks Pick the style that fits your family best. Wooden blocks, building blocks or Duplo are all great and accomplish the same thing: nurturing creativity and basic motor skills. No need to have all different types, pick the one you know your children enjoy or the one that you would be willing to sit down and do with them as they are learning. Kitchen Set This could be anything from a tea set or a set of dishes and utensils. Remember, the less they have the more they can use their imagination, so avoid acquiring all the pretend food. Children also seem to play just as much pretending to cook on a shelf, so no play kitchen is needed. Moluk Bilibo These toys work great, inside and outside. Seriously, watch the video on Amazon– so much fun!! Bunny Peek A Boo Ages 2-5 recommended. This cute game helps teach children logic, problem-solving and spatial dynamics. For the younger ones, can enjoy playing and “building” with it, and the older ones can learn to play the game: Pull out a card, find the pieces it says, figure out how to stack them/build them to look like the picture on the card. There are 60 “problems” to solve. When children are playing the game, it best to be on their level and help them work through it by asking questions and gentle suggestions. Roll and Play Game Ages 2 and up. This is an interactive game and will need an adult or older child to participate. It’s enjoyable, teaches them to take turns and follow directions, reinforcing what they are learning (find something green, “moo” like a cow, Jump, make a happy face, etc.). It’s just as easy to get the toys that seem impressive- but outdoors is the best time for a child to explore and get messy. Dirt is their friend! 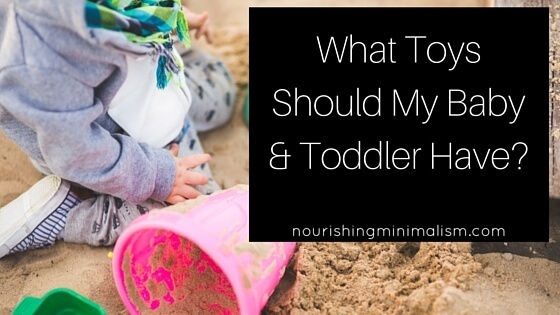 If you can, have a section of the yard that can be a sandbox or dirt-box, where the child can dig, drive, plant a “garden” or whatever else they want to do. Bucket and Shovel Digging, filling buckets and dumping them out again is so much fun for little ones. Buckets give them a place to collect things- whether it be dirt, grass, rocks or water. Vehicles These are great for playing in the dirt, driving on patios, etc. Follow your child’s interest and pick work vehicles, farm equipment or little cars. Bicycle For the very young a trike is good, and for taller kids, (30″+) Strider Balance Bikes are wonderful for getting them ready to ride without training wheels. A Slide If you live close to a park, or have a play structure, this probably wouldn’t be used for too long, but toddlers love climbing and sliding repeatedly. This helps them learn coordination and balance. Kitchen Toys These are listed on the “inside toys” list, but they double as outside toys- children get so excited when they get to have a picnic for a snack with their own dishes! Moluk Bilibo Yes, worth mentioning again- these are great for outdoor toys as well as indoor. Check them out here. Scraps of wood Children love building and creating. It’s important to let them invent their own outdoor toys, yes, even if they stack everything up and stand on top of it- taking risks is good for a child’s development. They may use them as roads, build a teeter-totter or a bridge. Do you have a suggestion? Leave a comment and tell us what toy that your little one used the most in imaginative play. Nice suggestions, Rachel. I definitely agree that books, balls, and rattles are perfect for the youngest children, adding blocks and kitchen sets as they get older. A bucket and shovel will keep them busy for hours outside! My kids also spent lots of time with silkies and old scarves for dress-up, and a big old quilt for indoor tents and forts. Big cardboard boxes were always a hit as well — they became cars, ships, hideaways, etc. Each kid always had a few favorite stuffed animals that became characters in their imaginary adventures. They always had paper and crayons, scissors and glue sticks, and got very creative with all of those things. Once they got to grade school, they had bikes (their dad taught them how to maintain their bikes), played with Legos, began to play musical instruments, I taught them to sew and knit, they eventually got their own cameras and started scrapbooking — all with an eye to helping them develop hobbies. One child was interested in birds and was given binoculars and started keeping a nature journal. And weekly library visits were a must — they were always reading. I love this post. i sent it to a few people as an idea list when buying gifts for young children. i have a 6-year old and would love your ideas on best toys etc for children in the 5-10 year old range. thank you for your blog … your posts are always helpful! The best toy for me is the train set. I just visited your blog/site and thought you made some really great points.Very Informative Article…. I’ve been reading several of your posts over the past week. You have some GREAT insights and ideas – thank you for sharing them! What a lovely list of toys. I got some great ideas. Big hugs for sharing this well written article!